The Solstice is one of five contemporary Solstice-class ships that can carry 3,000 passengers. The other ships include the Equinox, Eclipse, Silhouette, and Reflection. The Solstice ships are almost identical in layout and features including its dining options. 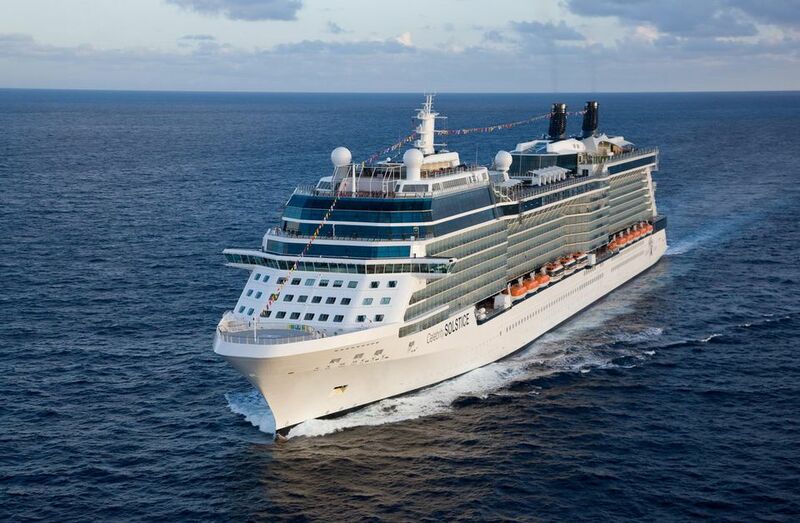 While cruising, the CelebrityLife Savor Program features food and drink events for passengers. This includes cooking demonstrations like cupcake decorating or sushi making, galley tours, chef cooking competitions, as well as food and drink tastings. A wine workshop and various alcoholic drink tastings come at an extra charge. Imbibing alcohol while onboard most cruise ships come at an extra fee. Celebrity offers several beverage packages for purchase. The most extensive package is the "premium package," which includes unlimited sodas, juices, specialty teas and coffees, smoothies, bottled water, beer, wine by the glass, many cocktails, spirits, and frozen drinks. Other packages include those for fountain sodas or bottled water. The ships have 10 diverse dining options. The beige and white Grand Epernay Restaurant is the main dining restaurant for the ship. It is named for the city of Epernay, which is in the Champagne region of France. The champagne-styled restaurant is aft on decks 3 and 4 with impressive chandeliers resembling bubbly. The Grand Epernay offers open seating for breakfast most days and three options for dinner—two fixed seatings at 6 p.m. and 8:30 p.m.—and Celebrity-select, which is Celebrity's version of open seating dinner. Guests must choose either fixed or select seating prior to their cruise. Celebrity-select open seating is starboard on deck 4 from 5:45 to 9:30 p.m.
Much like other cruise lines, the Grand Epernay offers a specialized, multi-course menu per seating. A sample menu selection may include escargot, gazpacho, shrimp cocktail, juicy prime rib, and crepes with chocolate-sprinkled bananas. The famed brunch buffet has all the standard breakfast fare along with Belgian waffles, omelets, and eggs Benedict. The sumptuous lunch spread includes sushi, a carving station, a wide variety of salads, and a chocolate fountain with fruit for dipping. Murano is a contemporary French restaurant on deck 5, and the most popular specialty restaurant onboard with an extra charge per person. This more intimate restaurant is perfect for celebrating a special event or a quiet, romantic dinner. Menu selections include foie gras, the very popular hot goat cheese appetizer, lobster and steak surf and turf, and an orange liqueur souffle made with Grand Marnier. For cruisers who love food from China, Japan, and Thailand, the Silk Harvest specialty restaurant on deck 5 offers a pan-Asian family-style dining experience. Located aft on deck 5, the Tuscan Grille is an Italian-inspired steakhouse specialty restaurant with wonderful views of the wake of the ship. If steak tartare or fried calamari is a favorite menu choice, you will be happy. Other popular menu selections include cioppino seafood stew, spaghetti bolognese, and Tuscan ribeye steak. For the sweet tooth, toffee pannacotta and tiramisu are clear winners. Blu is a specialty restaurant on deck 5 dedicated to passengers staying in the AquaSpa staterooms. Subject to availability, suite passengers can also dine at Blu. The restaurant offers an intimate, open-seating atmosphere and features healthy fare that is more calorie-conscious. Blu does offer traditional menu items, so you can choose healthy options or more decadent offerings like filet mignon. The AquaSpa Cafe serves lighter, healthier cuisine for breakfast and lunch. It is located in the adults-only indoor pool solarium, which has a quieter atmosphere. Another perk, you can grab a bite in your swimsuit and do not have to leave your spot poolside. Bistro on Five is a casual salad, sandwich, and sweet and savory crepe dining spot on deck 5 with a per person surcharge. Since it is usually open 20 hours a day (6 a.m. to 2 a.m.), it offers a great alternative for breakfast, brunch, lunch, or dinner. Stellar dessert crepes appeal to many flavor palattes—dulce de leche, Grand Marnier and candied orange, and Nutella, banana, and pistachio. For relaxed, poolside dining outdoors you will find the Mast Grill serving fast food favorites like hamburgers, hot dogs, grilled chicken, and French fries. The spacious, bright Oceanview Cafe is the ship's 24-hour buffet restaurant, which has the reputation as one of the best buffet restaurants at sea. The restaurant has various ordering stations, so you rarely experience a line unless you are assembling a made-to-order omelet for breakfast. Also, there is an outdoor seating area aft of the cafe. For breakfast, you can find your usual favorites. For lunch and dinner, you can choose soups, salads, carving stations, chef specials, and international cuisine with Indian, Italian, and Mexican delights. Cafe al Bacio and Gelateria on deck 5 was inspired by European cafes offering a la carte specialty coffees, teas, pastries, and an authentic Gelateria with artisanal flavors and fresh fruit sorbet. What Are the Best Dining Venues Aboard the Celebrity Solstice?